This week we are releasing the files of priests who sexually abused children while they were serving in the Archdiocese of Los Angeles. These files document abuses that happened decades ago. But that does not make them less serious. I find these files to be brutal and painful reading. The behavior described in these files is terribly sad and evil. There is no excuse, no explaining away what happened to these children. The priests involved had the duty to be their spiritual fathers and they failed. We need to acknowledge that terrible failure today. We need to pray for everyone who has ever been hurt by members of the Church. And we need to continue to support the long and painful process of healing their wounds and restoring the trust that was broken. I cannot undo the failings of the past that we find in these pages. Reading these files, reflecting on the wounds that were caused, has been the saddest experience I’ve had since becoming your Archbishop in 2011. My predecessor, retired Cardinal Roger Mahony, has expressed his sorrow for his failure to fully protect young people entrusted to his care. 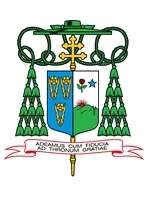 Effective immediately, I have informed Cardinal Mahony that he will no longer have any administrative or public duties. Auxiliary Bishop Thomas Curry has also publicly apologized for his decisions while serving as Vicar for Clergy. I have accepted his request to be relieved of his responsibility as the Regional Bishop of Santa Barbara. To every victim of child sexual abuse by a member of our Church: I want to help you in your healing. I am profoundly sorry for these sins against you. To every Catholic in the Archdiocese of Los Angeles, I want you to know: We will continue, as we have for many years now, to immediately report every credible allegation of abuse to law enforcement authorities and to remove those credibly accused from ministry. We will continue to work, every day, to make sure that our children are safe and loved and cared for in our parishes, schools and in every ministry in the Archdiocese. In the weeks ahead, I will address all of these matters in greater detail. Today is a time for prayer and reflection and deep compassion for the victims of child sexual abuse. I entrust all of us and our children and families to the tender care and protection of our Blessed Mother Mary, Our Lady of Guadalupe and Our Lady of the Angels.